For many centuries, the principle of triangulation - that is the geometric measurement using three-point relationships - has been relatively well known. In Europe, the land survey method established itself in the 18th century. However, it is possible to apply the procedure on a considerably smaller scale. Geometries can be measured very precisely on various surfaces using laser line triangulation. Micro-Epsilon sensors are based on this principle and can be employed in several applications. For operating a triangulation sensor using laser light, a laser beam is focused onto a target. A high spatial resolution sensor array, tilted at a fixed angle to the laser beam, detects the diffuse reflection on the surface. Changes in the distance between the sensor and the target also change the angle at which the reflected light is transmitted onto the sensor array and thus the position of the reflected light on the sensor array. Using the angular relationships in the triangle, the distance between the target surface and the sensor can be calculated. This measuring method allows measurement accuracies in the submicrometer range. It is also possible to extend this measuring principle to two dimensions by focusing the laser to a line rather than to a point. This technique is then known as laser line triangulation. Instead of a sensor array, a two-dimensional sensor element acts as the sensor. When the laser line is projected onto a shaped surface, the straight laser line becomes a surface profile and hence they are also known as laser profile sensors. It is possible to calculate this surface profile from the intensity values of the reflected light, which is transmitted onto a position-sensitive sensor element. Even if a third dimension is added, the target can be moved in a vertical direction to the laser line or the profile sensor can be moved vertically over the target. The sensor becomes a 3D laser profile scanner and therefore can create a three-dimensional image of the surface. 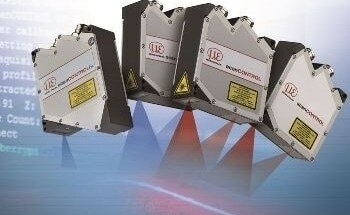 The performance of laser profile scanners is dependent on several factors. When all necessary components including the focusing lens for the laser line, the laser source, the sensor element and the receiving optics, are enclosed in a single body, the conditions are said to be ideal. Therefore it is much easier to control the mechanical and thermal stability of the laser profile scanner. Moreover, the distance between the target and the sensor, as well as the lighting, has an effect on the quality of the measurement results. For suppressing light interference, a filter is installed in front of the receiving optics, which only allows the wavelength of the laser light applied to pass through. Aside from these critical factors, other technical characteristics of the laser profile scanner also have an important role to play. The quality of the laser diode and the lens used decide the sharpness of the line that can be focused onto the target. The performance of the processor used and the spatial resolution of the sensor matrix are primarily responsible for calculating a surface profile precisely and rapidly from the reflected light. Moreover, the wavelength of the laser light plays a part in determining the precision of measurement results. When compared to traditional red laser diodes, the laser line of a blue laser diode can be more sharply focused onto the target. Since blue laser light does not penetrate the surface too deeply, the measurement results are further enhanced. Blue laser profile scanners can be used to detect surfaces that are difficult to measure using traditional red laser profile scanners -for example, semi-transparent materials, or organic materials such as food and wood. 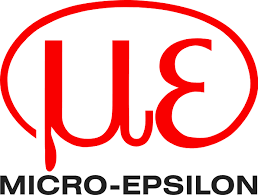 Micro-Epsilon provides a broad range of laser profile scanners based on the laser line triangulation measuring principle. The scanCONTROL series is among the highest performing profile sensors in the world. The scanners work using a CMOS sensor matrix that offers a resolution of up to 1,280 points along the x-axis - the direction of the laser line on the surface. The scanCONTROL 29xx-10/BL version with a 10 mm laser line length sets a new standard in terms of profile resolution. This results in a point distance of just 7.8 µm, which allows the laser profile scanner to provide twice the resolution of previous laser scanners with a 25 mm measuring range. Depending on the sensor version, the resolution in the z-axis can be less than 1 µm. Their high accuracy allows the laser profile scanners to detect even the smallest of parts to the highest precision. How precise the target can be moved relatively to the scanner decides the resolution along the y-axis. With measuring rates up to 4,000 Hz, it is possible to measure surfaces very precisely and at very high speeds. The scanCONTROL laser profile scanners are integrated with a powerful controller that is already integrated inside the housing. From the intensity values on the CMOS sensor matrix, the controller calculates the two-dimensional surface profile. Also, an evaluation of the profile can be done using the SMART sensor versions. These make it possible to perform frequently recurring, easy and complex measurement tasks in the sensor and to output these as measurement values. Set up and configuration is performed using the Configuration Tools PC software, which enables, for instance, the measurement of steps, grooves, and angles. Parameter sets are recorded in the sensor. Furthermore, output of an OK/NOK signal is possible. The user does not need any external control and evaluation unit. For instance, the height of a step on a surface can be measured and this height can then be output as an analog or digital signal via the interfaces. Alternatively, the scanner can output the "OK" signal if the value is in a predefined range; otherwise the signal is "NOK". From a total of 26 measurement programs, an individual parameter set with up to eight programs can be used with the scanner (‘user modes’). Additionally, up to 15 parameter sets can be saved in the scanner and these can be switched via digital inputs. In case the user wants to evaluate the profile data externally, the laser profile scanner can also output all raw profiles of the sensor matrix. An Ethernet interface with GigE Vision allows connection to a PC. For simplifying the integration into a customer’s own software, Micro-Epsilon provides libraries for C, C++ and C#, and LabView drivers as well. Integration into Linux environments is not an issue because of the corresponding libraries. Micro-Epsilon’s laser profile scanners are used in a wide range of applications. The scanCONTROL series demonstrates its strength whenever high measurement accuracy and resolution are required. It finds typical applications in electronics, precision mechanics, and in the manufacture of precision parts. Quality control in laser welding is also possible. For these and other applications, Micro-Epsilon provides special accessories to protect the scanner in harsh environments. For instance, a protective housing with exchangeable windows is available for welding applications. A unique compressed-air purge system safeguards the optical components from dust. In addition, the scanCONTROL can be inserted into a cooling jacket for use in high ambient temperatures. The completeness of weld seams, the position of razor blades, the correct gap size on a car chassis, and the optimum dose of an adhesive - all of these applications have been successfully solved in recent years using Micro-Epsilon’s precision laser profile scanners. This information has been sourced, reviewed and adapted from materials provided by Micro-Epsilon. For more information on this source, please visit Micro-Epsilon.